How the Railroad Named Fanwood, New Jersey ~ The History Girl! It's interesting how railroads once played a major part in the development of the United States and is even responsible for the naming of communities, such is the case with the Borough of Fanwood, New Jersey. A small community of just 1.3 square miles and a population of just over 7,000, it was a community that due to circumstances surrounding its charter, a railroad company suddenly became a real estate company, building a suburban paradise with a direct connection to urban centers in the late nineteenth and early twentieth centuries. On February 9, 1831, the Elizabethtown and Somerville Railroad received its legislative charter to develop a railroad through the area that is now Fanwood. The goal of this railroad was to connect the Pennsylvania coal fields with the New York area. Construction began in 1832 in Elizabeth and by 1837, the line reached present-day Fanwood. However, the original right-of-way did not follow that of today and was built north of its current alignment (what is now Midway Avenue) because the locomotives at that time could not climb the hill to the south. In 1839, a station, called Scotch Plains Station, was constructed at the intersection of Martine Avenue and the rail line. At this time, the railroad had reached Plainfield. In 1840, the construction paused as the rail line reached just outside the town of Bound Brook. In 1842, the line reached Somerville. However, the Railroad company found that it could not generate enough revenue to cover the cost of construction and on February 20, 1847 declared bankruptcy. The Railroad was purchased by John Sterns and Coffin Colket and reorganized under a new charter as the Central Railroad of New Jersey (CRRNJ). CRRNJ began to acquire land in 1867 to relocate the line in Fanwood from the northern alignment (modern-day Midway Avenue) to its current location. The company's charter from the state required the railroad to acquire all the land between the old line and the new line, which ended up amounting to about 350 acres. On December 6, 1874, the the Midway Avenue line was abandoned and the new southern alignment opened. 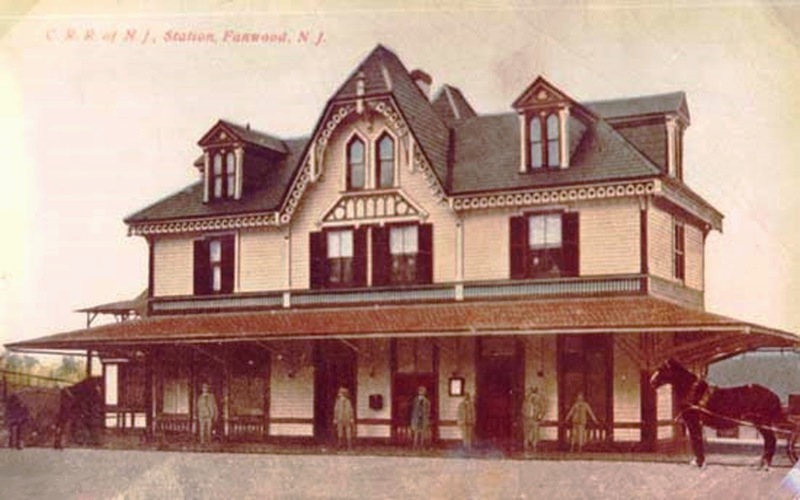 The station name changed from Scotch Plains to Fanwood, a name conceived by president John Taylor Johnson of the Central Railroad of New Jersey in honor of Fanny Wood, daughter of one of the railroad officials, a journalist, and frequent visitor to the area. With the acquisition of large swaths of land in between the old and new alignments, the Central New Jersey Land Improvement Company was created by the CRRNJ in 1867 as a land development company. For the next forty years, the land would be developed by the railroad into suburban housing lots laid out on a network of curved streets and called Fanwood Park. The new homes built by the railroad became attractive to commuters traveling to work in the New York City area. The development of Fanwood Park was also encouraged by the CNJ's fast, frequent and punctual commuter trains which terminated at the Jersey City Terminal. Passengers would then board the ferries to various Manhattan locations. The historic Fanwood Station was built and opened in 1874, at the opening of the new southern alignment. It was designed in the Stick style with Gothic Revival elements, such as the pointed-arch windows on the third floor, bargeboard, and finials. The station is two stories with a third floor attic space. The main station building was one of several New Jersey stations to be constructed in this style. Similar stations constructed at Branchport, Bound Brook, Perth Amboy and Asbury Park are no longer standing; the Matawan Station on the North Jersey Coast Line remains minus its gingerbread and Red Bank Station. A view of Fanwood Station with a modern-day NJ Transit train from the pedestrian bridge. In May 1895, residents in Fanwood Village voted to separate from the Township of Fanwood (now Scotch Plains). As this new railroad community developed, the railroad still played a large part in encouraging settlement by sponsoring publications that painted an ideal suburban lifestyle with easy access to the city via rail. In 1965, the station was sold to the Borough of Fanwood and converted for community use. It was added to the National Register of Historic Places on July 17, 1980. In 2004, the Fanwood Park Historic District was listed on the National Register. This historic district covers the neighborhood conceived by the CRRNJ and lists the historic Fanwood Train Station as key contributing structure for its contribution to the development of Fanwood and it is the oldest extant train station in Union County. The train station, fully restored, serves as a museum and meeting place under the auspices of the Fanwood Historic Preservation Commission. It is open to the public and displays information and artifacts related to the railroad and the Borough of Fanwood. One great time to visit is during Union County's Four Centuries in a Weekend on October.